This feels like the longest winter in history. It’s just never-ending. I’ve been so busy since I last posted in November that most of this never-ending winter has seemed to pass by quickly, but it still feels as if it should be over by now. I spent part of the winter watching old episodes of Pushing Daisies each evening, a TV show that came on a few years ago about a piemaker named Ned who has the magical ability to bring dead people, animals, and plants back to life, with the catch being that he can’t touch them again or he will kill them forever. On the show, they always showed images of huge mouth-watering pies displayed in Ned’s pie shop, the Pie Hole, in the background. My favourite part of the show was when Ned’s brought-back-to-life girlfriend, Chuck (a.k.a. Charlotte) would bake pies with gruyère cheese baked into the crust and homeopathic liquid antidepressants dropped into the filling for her two mourning, cheese-loving aunts, who didn't know that she had returned from the dead. Chuck would make the pies and then have them secretly delivered to her aunts to cheer them up. 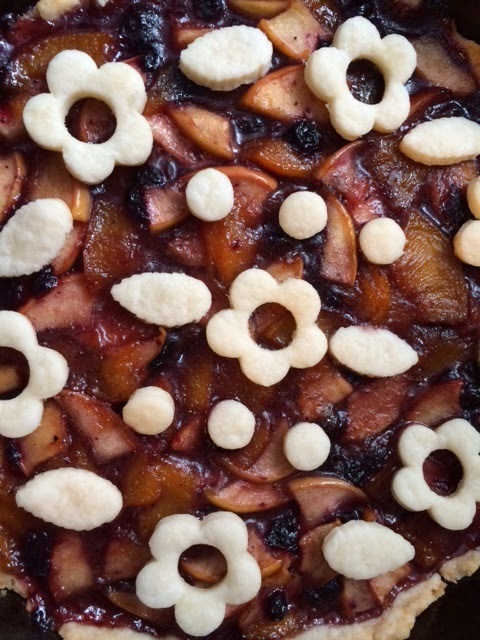 I don’t know that this winter has been bad enough to start baking antidepressants into my desserts (although putting cheese in the crust is something I definitely have to try), but in my attempt to will spring into existence, I decided to make the first pie of spring today. It’s apple, peach and blueberry. 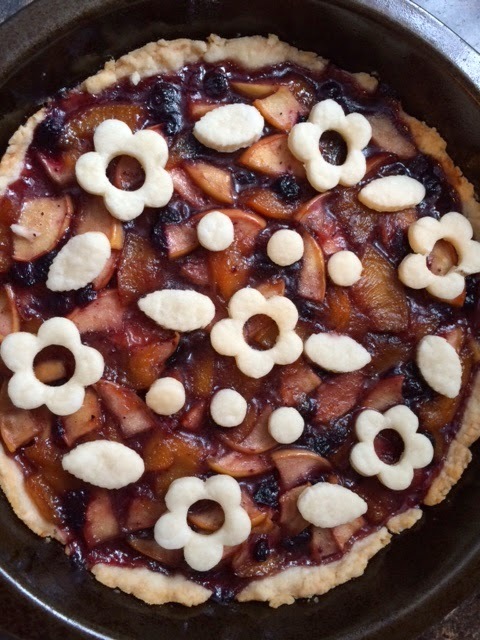 I made half of my favourite Perfect Pie Crust recipe and I used the leftover pie dough to cut out flower and leaf shapes. I baked these on a separate baking sheet and then placed them on top of the pie once I took it out of the oven to cool. 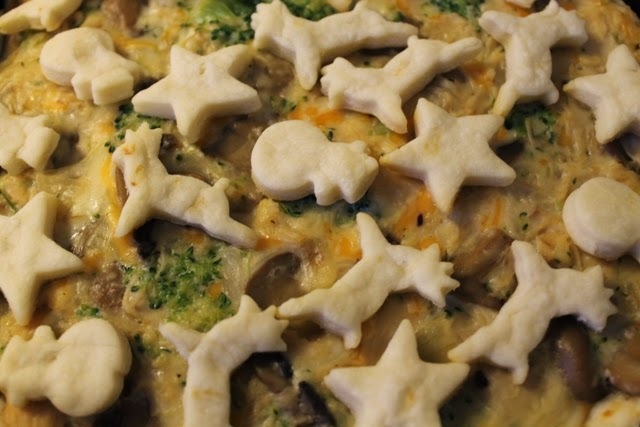 This pie reminded me of some pies that I made in December: a Christmas chicken and broccoli pie and some starry lemon mini tarts. 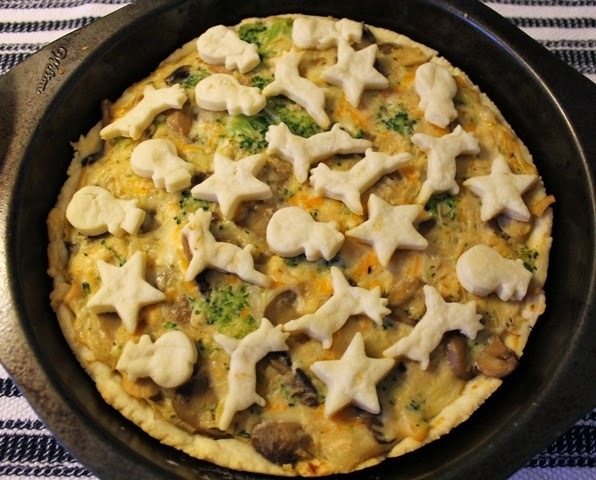 For the Christmas chicken pie, I cut out small Christmas shapes (snowmen, reindeer, and stars) and baked them separately for a few minutes on a baking sheet, and then added them to the top of the pie once it came out of the oven, just like I did with the spring pie. 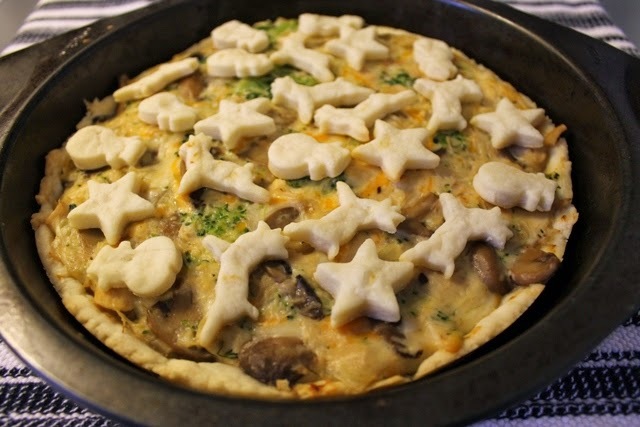 The pie filling was made of chicken, broccoli, mushrooms, onions, garlic, milk and cheese, with flour to thicken, that was cooked ahead of time before being added to the crust. 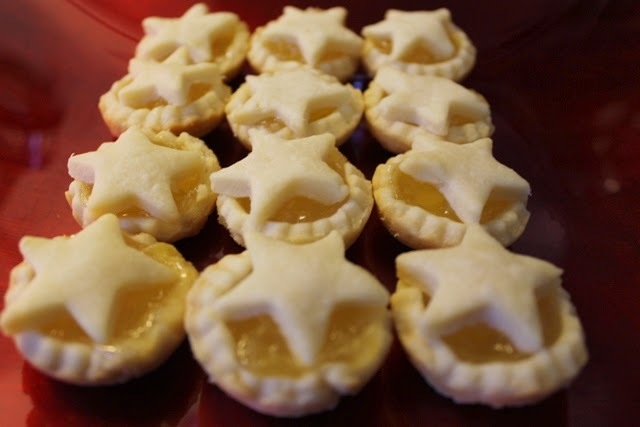 I also made starry lemon mini tarts. I made my own lemon curd for the tarts. 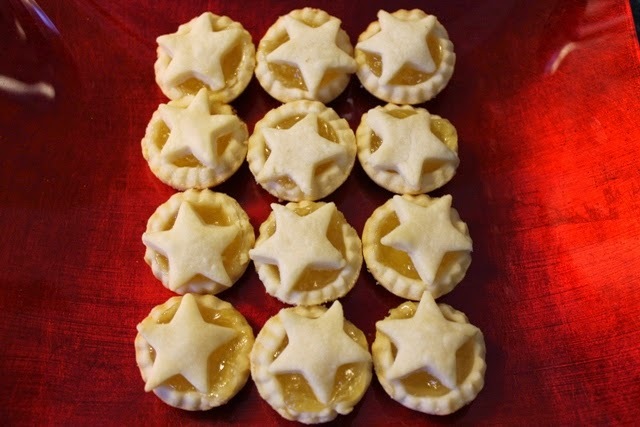 These tarts were made to look like traditional British Christmas mince pies with the star on top, which I’ve never made and never tasted. There’s something about the word “mince” that turns me off. I’ve never seen mincement in the stores and I don’t know if I want to make it myself. I think I’d like to try these little tarts with a chocolate filling. Maybe Nutella with chopped, toasted hazelnuts mixed in. Hazelnuts are pretty Christmassy. 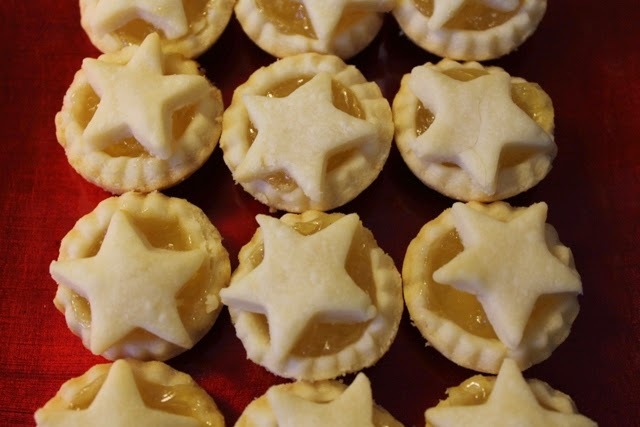 Looking at these pictures of my Christmas pies reminds me that I still have a bunch of photos of Christmas food from last year that I haven’t had a chance to share. When I get time, I will post them. Hopefully before next Christmas. And in case you are still digging out from this long, miserable winter and don't have access to a pie with cheese and antidepressants baked into it, here’s something that’s sure to help brighten up your day: a Mini Maestro from Kyrgyzstan who takes her conducting very seriously and very cutely. All photos and original content copyright Makey Bakey 2010 - 2011 unless otherwise indicated. Ethereal theme. Theme images by merrymoonmary. Powered by Blogger.